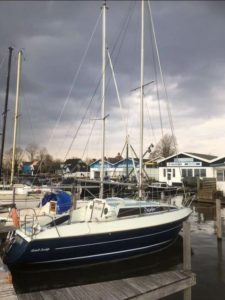 We welcome you a board of the Rebel dolphin, with good weather the Rebel is rentable for Sailing and just touring trough the canals of Amsterdam. No sailing experience is needed just the wish to learn and listen to the instructions of the captain. 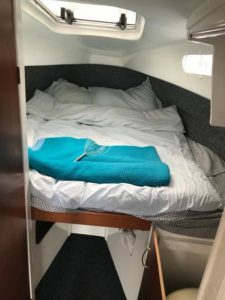 To sleep on the boat is also possible we just need to find a harbour of choice who accepts us for one ore two nites, you will pay the harbour costs & tourist tax and you receive a safe place to sleep, toilets and showers are usually inside the harbour of choice. Would you like to come a board ? 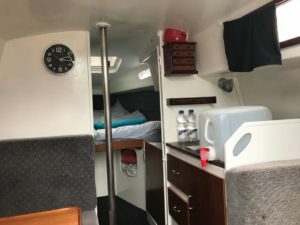 Welcome to this unique boatstay experience! This small sailingboat has the cozyness of being inside and on the water. Just walking distance from the Ferry to Central station. The whole boat is yours for the night. Be prepared for camping life we have NO shower, a simple boat toilet and 12 volt electrics. Showering can be done at local campsite vliegenbos, Zeeburg or Central station. We are on the water, so make sure you can swim or know how to use lifejackets !! You will have to walk 15 minits from buiksloterweg to get to the ferry. You can contact me trough Facebook Messenger ore WhatsApp. I live 25 minutes from the venue.